This article gives an overview of the Non-Access Stratum (NAS) and its protocols EMM and ESM. The Non-Access Stratum is a set of protocols in the Evolved Packet System. The NAS is used to convey non-radio signalling between the User Equipment (UE) and the Mobility Management Entity (MME) for an LTE/E-UTRAN access. From a protocol stack perspective, the NAS is the highest stratum of the control plane, as shown in figure 1.
the EPS Session Management (ESM). The EPS Mobility Management protocol refers to procedures related to mobility over an E-UTRAN access, authentication and security. It is the equivalent in EPS of MM in GSM and GMM in GPRS. EMM common procedures refer to various network-initiated mechanisms. EMM specific procedures are UE-initiated. These procedures define attach/detach (to/from the EPC) mechanisms. They also introduce the Tracking Area Update (TAU) mechanism, which update the location of the UE within the network. Tracking Area is the equivalent in EPS of Location Area in GSM and Routing Area in GPRS. In EPS, a UE initiates a Tracking Area Update when it detects that it enters into a new Tracking Area. EMM specific procedures also define periodic Tracking Area Update. EPS also introduces the concept of Tracking Area List (TAL), which allows the provision of lists of Tracking Areas in UEs. 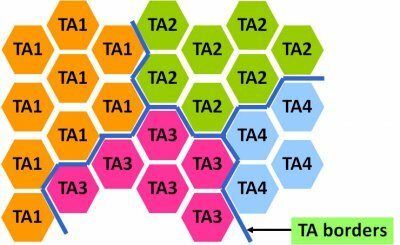 A UE does not need to initiate a TAU if it enters a Tracking Area which is included in its TAL. Provisioning different lists to the UEs within the network avoid signalling peaks for instance when all UEs on a train cross a TA border. The EPS Session Management protocol offers support to the establishment and handling of user data in the NAS. 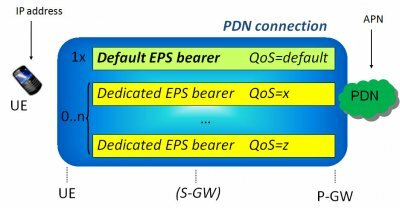 As shown in figure 3, a PDN connection is composed of a default EPS bearer and possibly additional ones called "dedicated bearers". A default bearer is created upon establishment of a PDN connection. If a service (e.g. video streaming) requires specific handling in terms of quality of service (QoS), dedicated bearers can be established. Within a PDN connection, all EPS bearers share a same UE IP address and an APN. EPS supports multiple simultaneous PDN connections. For instance, a UE can have a PDN connection to the Internet (with just a default EPS bearer) and one to the operator’s IMS (with additional dedicated bearers, if required by the service). 3GPP TS 24.303 defines inter-system mobility between LTE and non-3GPP accesses.